James Comey didn't bury Donald Trump in his Senate testimony, but he dug a Trump-sized hole in the ground. While the former FBI director danced around what, if anything, the ongoing investigation into possible Trump campaign Russia ties has found, he was much more forthcoming about his relations with the president, before and after his dismissal - and how they made him feel. He was confused by the circumstances of his firing. He felt the president and his staff "defamed" him and, more importantly, the FBI as a whole. As for allegations that the bureau was in disarray? "Those were lies, plain and simple," he said. He left drawing conclusions about the president's behaviour to others, but the picture he painted wasn't a flattering one. Mr Trump may not have been scheming, but his efforts to draw a pledge of loyalty from his FBI director, his pleading for him to go easy on his former national security adviser and his repeated requests for assurances that he, personally, was not under investigation were ham-handed at best. This, of course, was Mr Comey's moment, and it's his version of events that were in the spotlight. His descriptions have been (and will probably continue to be) vehemently disputed by the president and those who speak in his name. 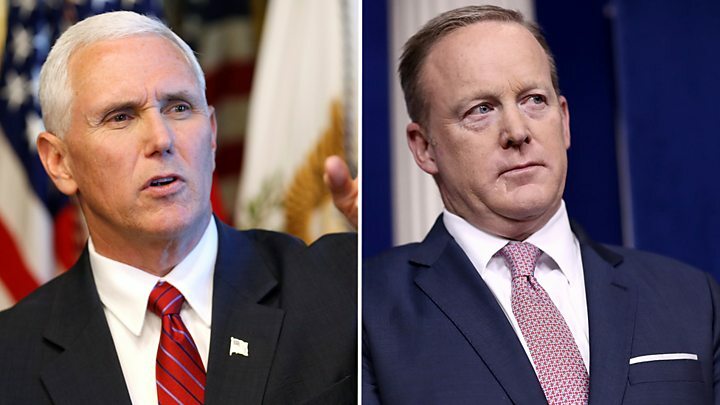 "I can definitively say the president is not a liar," Deputy White House Press Secretary Sarah Huckabee Sanders said on Thursday. This all sets up a "he-said, he-said" conflict. As Mr Comey himself acknowledges, during the key meetings with the president, the two men were the only ones in the room. The former director, however, comes armed with a career reputation as a straight shooter - sometimes to a fault - who is willing to take what he views as the correct course even in the face of powerful adversaries. The president comes off a brawl of an election campaign, with more than half the American public doubtful of his very fitness for office. Mr Comey also confirmed he wrote numerous contemporaneous memos about his interactions with the president - and even had a friend share their contents with the media - which gives additional heft to his account. Here a few other key takeaways from Thursday's historic testimony. 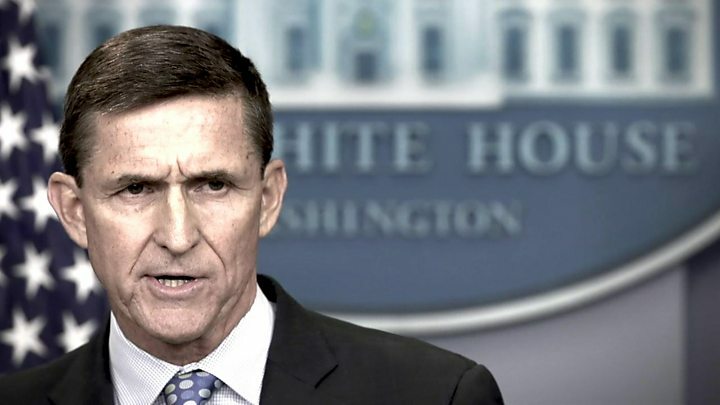 Ever since the New York Times first reported that the president had urged his FBI director to go easy on Michael Flynn, his former campaign aide and short-lived national security adviser, Washington has been anxious to hear Mr Comey's take. Not from anonymous sources or friends, but from the former director himself. It turns out his version is pretty much what had been reported up until now. Somewhere, reporters for the Times and the Washington Post are smiling. "I hope you can see your way clear to letting this go, to letting Flynn go," Mr Comey says the president told him. "He is a good guy. I hope you can let this go." The former director did take a bit of heat off the president when he noted that he felt he was only being asked to back away from prosecuting Flynn for lying to federal agents about his December conversation with Russian Ambassador Sergei Kislyak. "I did not understand the president to be talking about the broader investigation into Russia or possible links to his campaign," he says. The reality, however, was that Flynn was firmly in the crosshairs of the investigation. "He was in legal jeopardy," Mr Comey said. After his conversation with the president, the director said he discussed the issue with his FBI colleagues and notes that the request was "very concerning". He said, under questioning, that while Mr Trump framed his request as a "hope", he "took it as a direction" - and he decided to not to share those instructions with the FBI investigators. "I think if our agents, as good as they are, heard the president of the United States do that, there is a real risk of a chilling effect on their work," Mr Comey said. The other big New York Times revelation that swept through the nation last month was that, in a one-on-one dinner shortly after his inauguration, Mr Trump reportedly asked Mr Comey to give him assurances that he would be loyal. The president flatly denied this account of the dinner - but Mr Comey has now repeated it, under oath (with a twist). His account sounds like a political haggling skit written by Monty Python. Mr Comey told the president he would be "reliable". Mr Trump countered that he wanted - needed - "loyalty". The director says he froze, as though confronted by a wild beast while hiking in the woods. "I didn't move, speak, or change my facial expression in any way during the awkward silence that followed," he says. Mr Trump countered with "honest loyalty" - a term on which they both agreed. While the conversation was confusing, Mr Comey said his conclusion from it was clear given that earlier in the dinner they had discussed the director's continued tenure in office. "My common sense told me, he's looking to get something in exchange for granting my request to stay in the job," he said. In Mr Trump's letter firing Mr Comey, the president went out of his way to mention that the director had told him three times that he was not under direct FBI investigation. That assertion raised eyebrows among legal experts, since such statements usually only come from prosecutors and not law enforcement officials. On Thursday Mr Comey gave some context to those assurances. During a 6 January meeting, Mr Comey informed President-elect Trump he wasn't the subject of a "counter-intelligence" investigation, which he said tends to look at whether Americans were "witting or unwitting agents" of foreign powers. Mr Comey revealed that there was a debate within the FBI over whether to give the president any such assurances, given that the investigation covered the Trump presidential campaign and Mr Trump was the candidate. According to Mr Comey, one FBI leader insisted that Mr Trump's "behaviour, his conduct, will fall within the scope of that work". Mr Comey decided to tell the president anyway. 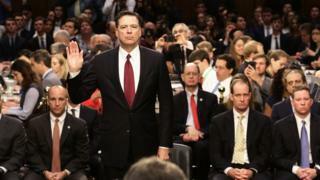 Where the dispute with the Mr Trump arose, according to Mr Comey, was whether the FBI should make it clear Mr Trump wasn't in the investigatory crosshairs. The director was concerned if the FBI went public, it would "create a duty to correct, should that change". That is, if Mr Trump eventually was swept up in the inquiry the FBI would have to make another public announcement, much like there was with the now-infamous October letter to Congress about the Clinton email investigation. Mr Comey also said he could only comment on the status of the investigation up until he was fired. As special counsel, Robert Mueller at this point could very well be looking into obstruction of justice by the president as part of his inquiry. Another curious revelation buried in Mr Comey's testimony was that Mr Trump was less concerned about possible legal predicaments of his staff (Mr Flynn, it seems, being the notable exception). "If there were some 'satellite' associates of his who did something wrong," Mr Comey said the president told him, "it would be good to find that out". How those "satellite associates" might react to the president's supposed declaration - and what they might do if they eventually face criminal prosecution - will be an interesting question to ponder in the coming days. What also has come into focus this week is the strategy the White House will pursue to counter Mr Comey's testimony. According to Marc Kasowitz, Mr Comey's account was vindication where it helped the president and untruthful where it didn't. When the former director said he was not under investigation? True. When he said that the president asked for - needed - his loyalty? False. It's a fine line to walk, to say the least. Another prong of the response builds on the attacks the president launched last month, painting Mr Comey as a "showboater" and a "grandstander" - a man more obsessed with press clippings and the limelight than the FBI's role in defending national security. 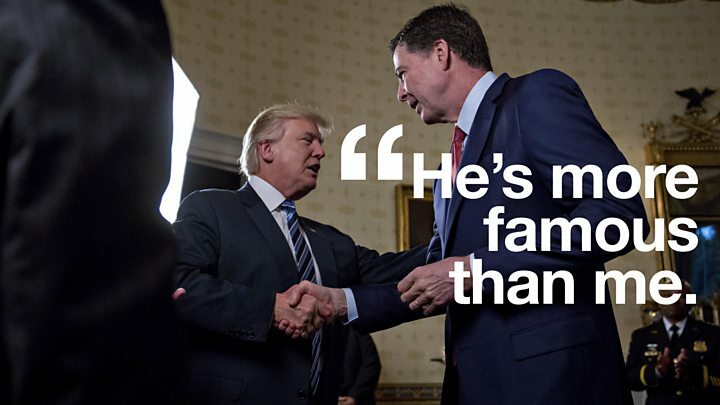 This was the line explicitly advanced in a television advert funded by a pro-Trump political group that aired on cable news channels on Thursday, which criticises Mr Comey for meddling in US politics and ignoring terrorist threats and calls him "just another DC insider only in it for himself". Kasowitz also took a shot at Mr Comey's admission that he instructed a friend to share details of his conversations with the president with the media - in response to the president tweet about "secret tapes" of their meetings. "It is overwhelmingly clear that there have been and continue to be those in government who are actively attempting to undermine this administration with selective and illegal leaks of classified and privileged communications," he said. "Mr Comey has now admitted that he is one of those leakers." Mr Comey's memos weren't classified, but Kasowitz's accusations will start a debate over whether they were privileged communications. Mr Trump's prior willingness to talk about his conversations with Mr Comey will make that a challenging case to make. According to media reports, the president wholeheartedly endorses this bare-knuckles response to Mr Comey. Given that the former director's testimony is going cast a shadow over the Trump presidency for months, if not years, the White House counterattack is almost certainly only just beginning. The president's lawyer has made his statement - now all of Washington waits for a presidential tweet-storm. The president has held his tongue so far. But how long can that possibly last? The fireworks of the Comey public testimony may be past, but the show is far from over. The former director also spoke to senators in a closed-door session on Thursday, and chances are good that details of those conversations will eventually seep into media reports. In the coming days attention will return to the ongoing work of the congressional committees investigating Russian meddling in the 2016 presidential election. Will they be able to avoid partisan bickering, or did Mr Comey's appearance inflame existing tensions between Democrats and Mr Trump's Republican supporters, derailing attempts at reaching consensus on how to proceed? Time will tell. The involved committees will continue to subpoena documents, and there's the prospect of past and present Trump aides being called to testify - including Flynn, Trump son-in-law/senior adviser Jared Kushner and former campaign manager Paul Manafort. Meanwhile Mr Mueller's investigation will continue to quietly grind away out of the public eye. With no clear timeline on when it will complete its work, the effort sits like a smouldering volcano on the horizon. If it erupts, it could put members of Mr Trump's inner circle in legal peril and, possibly, implicate the president himself. Even if the White House's worst fears are never realised, the mere threat will shape the actions and attitudes in Washington for months, if not years. How damaging is 'Comey memo' for Trump? Did President Trump fire James Comey as part of a cover-up?